I can’t say that I have always been a fan of meatloaf. Meatloaf is basically the opposite of how I eat meat. In our house, feeding 6 or 7 people every night, I rarely use more than a pound of meat (if any) for all of us. Meat is never really the focus of our meal – it’s more like an enhancement. Stir fries, soups, crockpot meals – the focus is usually on the veggies. But, once in awhile, when I need something really easy and really tasty, this kid-friendly super delicious meatloaf fits the bill. When I make meatloaf, I always use more than one kind of meat – usually something seasoned like pork sausage or Italian sausage – and then something simple like ground beef or ground bison or even ground turkey. The combination adds more flavor and moistness – I don’t recommend straight up ground beef meatloaf. Since we get all of our meat from farmers around North Carolina, I use whatever I’ve got in my fridge that month. This recipe is very, very flexible! For my finishing touch, I brush it with more barbecue sauce and coarse sea salt and freshly ground pepper. 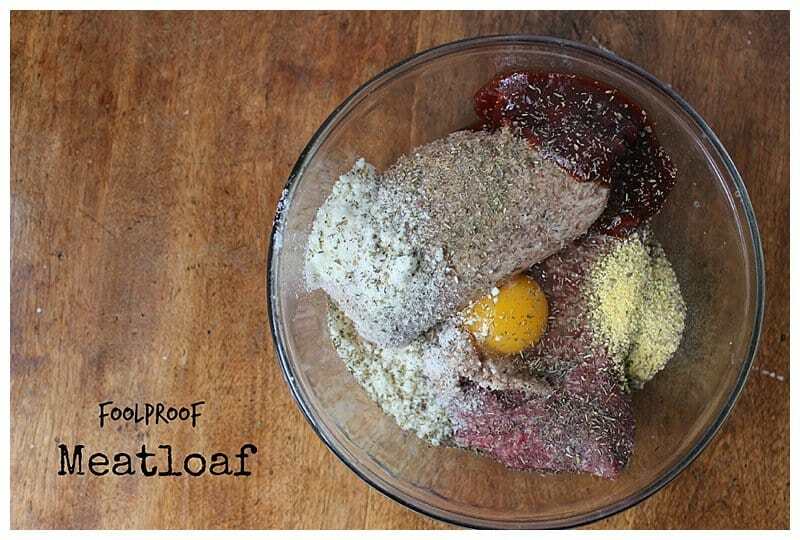 If all the ingredients that go into your meatloaf are tasty, you can’t help but to have a delicious final product. 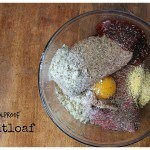 Super easy, super quick meatloaf that your whole family will love! Combine all the ingredients in one large bowl using your hands. Brush additional barbecue sauce over the top. Sprinkle with coarse sea salt and freshly ground pepper. Bake at 375 degrees for at 60 to 75 minutes. Cook the meatloaf on a lower rack to prevent the barbecue sauce on top from getting overcooked. Serve with your favorite veggies and a green salad. For a true comfort food meal, serve with mashed potatoes and peas! Enjoy! I have a hard time getting my 3 year old to eat red meat, but I’m going to have to try this out! 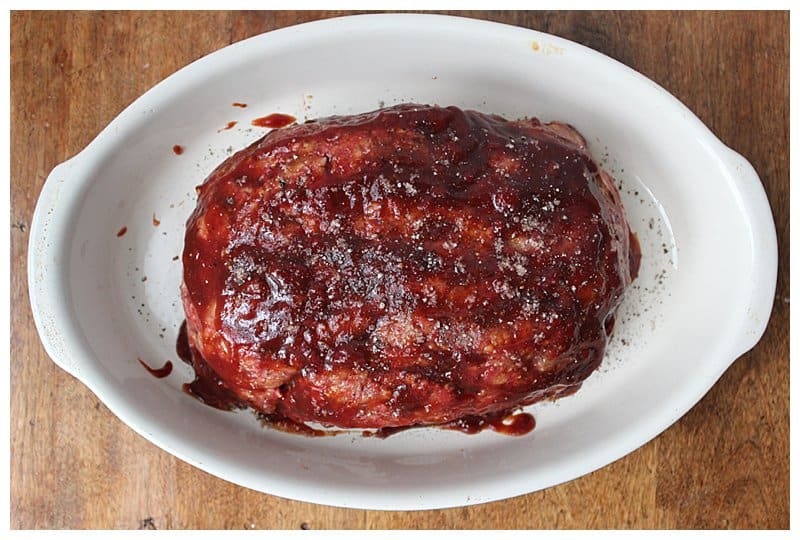 I haven’t found a good meatloaf recipe, and this looks perfect! I’d love if you’d come share some recipes on our #TryABiteTuesday Link Party at Caleigh’s Kitchen! Hey, Amber!! How did I miss this note from you? I will definitely check out #tryabiteTuesday at Caleigh’s Kitchen and share some recipes. Red meat can be tricky with little kids! I hope your daughter likes it. I LOVE meatloaf. It’s one of my favorite dinnertime comfort foods. My kids love meatloaf! This is a great recipe for them to try! Thanks, Sabrina! It’s very kid-friendly – they can even help make it! This is a wonderful meal to have kids help you make!! I know both of my girls would enjoy making (and eating) this!! YES! You are right, Kaitie! Very kid-friendly preparation – and very hard to mess up. Even just cracking the egg in the bowl brings some smiles!